Welcome to "Peekskill Project 6," a citywide art exposition organized by the Hudson Valley Center for Contemporary Art. Fifty-eight artists are represented, in 20 venues: more women than men, which is unusual even in the art world. Project 6 includes sculpture, performance, video, installation, photography—and a little painting. This is an international affair, with participants from Denmark, Australia, South Africa, Poland, Ukraine, Italy, Canada, Holland, South Korea, China, Brazil, and Germany. There are world-famous artists like Olafur Eliasson, and total unknowns. This is the sixth citywide art celebration; the first was in 2004. "Some 640 artists have come through Peekskill Project, and over 100 of them have really landed well; they've built substantial careers," notes Livia Straus, cofounder of the Hudson Valley Center of Contemporary Art. In some cases this year, Peekskillites assisted the artists. Philadelphian Megan Snowe had a weeklong residency, during which she asked local citizens for "endings"—the last sip of a soda, a clipping of hair, etc. The resulting artifacts are displayed on hanging strings before the words "THE END," which fill a wall. This installation is a series of riddles. Why is the cover of Daniel Defoe's Journal of a Plague Year included? Or the attachment to an electric toothbrush? Or a blue cloth? The End may legitimately be called a collaboration with the people of Peekskill. As may Inside Peekskill, by Danish photographer Nina Mouritzen: a collection of portraits of local residents taken at the farmers' market. The pictures were blown up to 24" x 36" and wheat-pasted on the front of an industrial building at 150 North Water Street. "People stop in here just because they see someone they know on the wall," explained Emilie Nilsson, the project coordinator. "Peekskill Project 6" has gentle political accents. I see echoes of the Occupy movement in Hudson Appliqué (Edition #2) by Australian Léa Donnan: 14 tents made of crocheted quilts, in a field next to the railroad tracks. In the sharp autumn light, the perfectly mismatched colors gleam brilliantly. These empty dwellings suggest an invisible tribe of idealistic nomads. COV (Cathedral of Viewing) by Raphael Griswold is inspired by structures arranged along the American coastline to watch for German submarines during World War II. This roofless hut, constructed of particleboard, has a long glassless window centering on the Indian Point nuclear reactor 2.8 miles away. The German military is no longer a threat; our real dangers are disguised as "power plants." 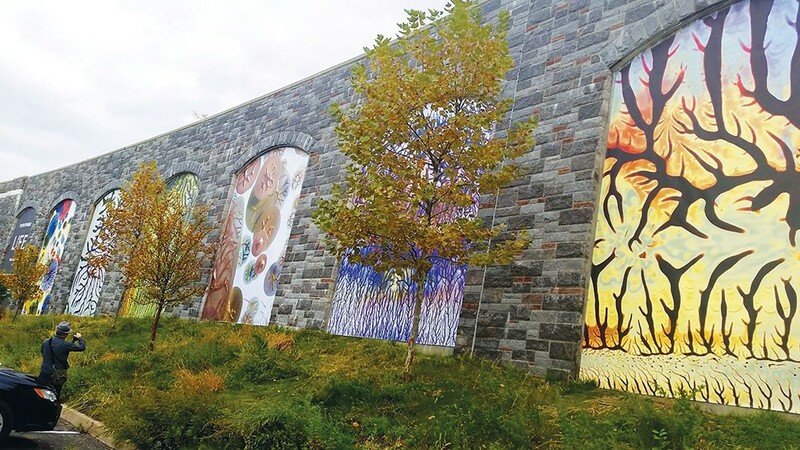 "Peekskill Project 6" will be on view until December 31 at locations throughout the city. (914) 788-0100; Hvcca.org.